Carole found this at her grocery. I had to go to the grocery on the last day of my vacation and I didn't see this. Admittedly, I was doing a quick run for snacks for a Dungeons and Dragons game so I didn't have time to really search the shelves, but, from experience, interesting versions of cereals don't often make it to Mariano's. Perhaps they are trying to save us from ourselves? It's the color of rainbow sherbet; orange, lime and raspberry. I asked Carole how it tasted before I opted to try it. "Meh. It's like Pebbles, just different colors," she said. 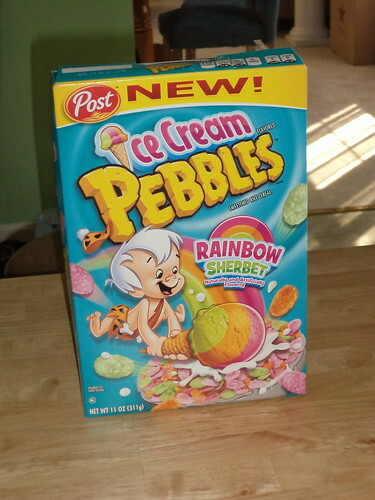 It's been awhile since I had Pebbles so I couldn't quite remember that flavor so let's try a bowl and see. It's okay, as sugary breakfast cereals go. I would be more charitable than Carole and say there is a hint of sherbety flavor. 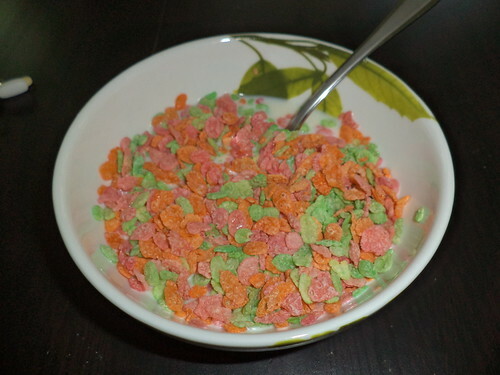 There's definitely not the creamy taste of sherbet or the taste of the individual flavors, but what I remember as the taste of Fruity Pebbles is not completely there. It was pretty good. I'd like to find a box of this and Fruity Pebbles and have a taste test. That might require wandering into Jewel grocery stores, which I really, really don't like. Times like this I miss Dominick's so much.